Harmonies can turn a good song into a great song. 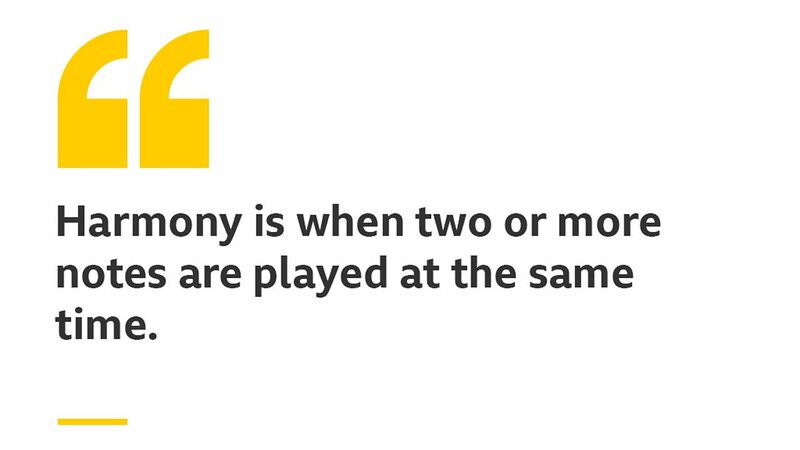 Playing or singing more than one pitched note at the same time creates a harmony. Many harmonies are made up of chords. A chord is when two or three pitched notes are played at the same time. Some of the most popular chords in music will use at least three notes. For example, the chord of C is created by playing the notes of C, E and G together. Harmony can easily be created by a group of voices. Listen out for 'Barbara Ann' in the animation. It was composed by the Beach Boys who are world-famous for their incredible vocal harmonies. In the new Ten Pieces III film, Lemn Sissay explores Kerry Andrew's brand new song with facts, insight and animation. Watch the full performance of Kerry Andrew's song by the Ten Pieces Children's Choir. What are melody and pitch?